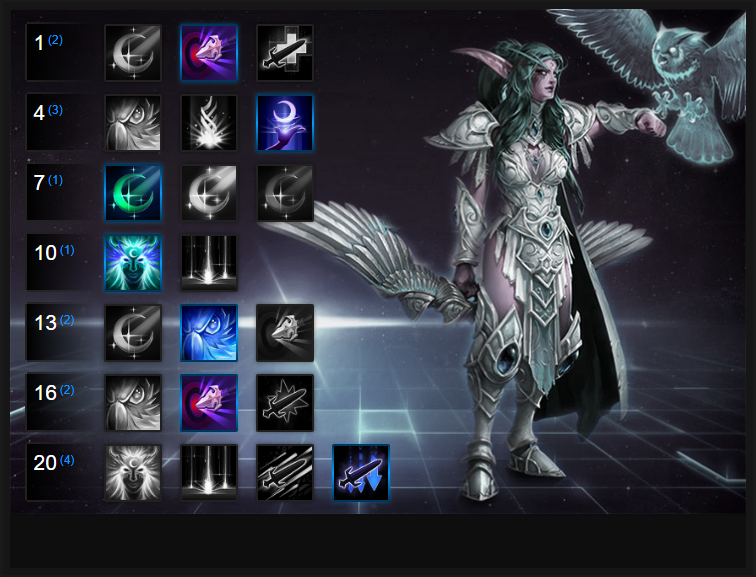 In this Tyrande Build Guide, we provide an overview of her strengths, abilities and talents. Tyrande is a Support Hero that's capable of delivering high amounts of healing, as long as she can continually attack her target. With a powerful single target heal, and a valuable Heroic that also provides healing over time, she's undoubtedly capable of healing on a par with the best Supports. Not only that, but she brings with her a powerful stun, lots of utility and an innate ability that boosts your teams damage by 15% on a target. With the right composition she can keep any team alive with ease, and while she'll always be vulnerable to dive - like any Support - , careful use of her stun, continued scouting, and Shadowstalk (if needed) ensures she's tough to bring down. Hunter’s Mark (Trait) – This is a huge part of Tyrande’s power. She’s the only Hero able to lower armor at level 1, and can do so at no mana cost. An early gank will have a much higher chance of success with Tyrande involved, and you should be using this in team fights to help your assassins eliminate their targets as quickly as possible. Hunter's Mark also works on all minions, camps and Objectives so on Battlegrounds such as Battlefield of Eternity, Tyrande brings a free 15% damage boost against the target. Light of Elune (Q) – With two charges, and with basic attacks and abilities lowering the cooldown of Light of Elune, it's an incredibly powerful heal. Not only does it provide an instant burst of healing, but it's also targetted meaning you can't miss. As long as you are constantly attacking enemies, you'll always have a heal available. Sentinel (W) – Vision is extremely important, as it gives vital information when you’re deciding if you should take a merc camp, challenge the boss, or even just chase a kill. As long as you have the mana for it, use Sentinel as much as possible in critical locations to give your team as much information as possible. The damage is somewhat negligible by default, though due to the global range, you can use this ability to snipe an enemy that just barely got away. Lunar Flare (E) – Using this ability well will make or break your play on Tyrande. When used properly, Lunar Flare offers a small AoE stun that cannot be body-blocked, meaning enemies cannot protect their assassins. Due to the delay, it’s often helpful if you’re able to follow up on more reliable crowd-control, though not absolutely necessary. Particularly in the chaos of a team fight, it can be a simple matter to lock down a priority target, or interrupt an important channel. Shadowstalk (R) – Providing Tyrande and her team with an immediate stealth, Shadowstalk also heals over time and grants Invisible if those stealthed remain stationary. For mitigating large amounts of damage, or to sneakily attacking the enemy team, it's undoubtedly one of the strongest Heroics in the game. Just be conscious of the fact it has a long cooldown, and its heal is incredibly valuable, so don't always use it just to save your own skin. Starfall (R) – This heroic ability can completely change the mood of any team fight. Not only does it offer a large AoE slow, but the damage will be extremely significant if enemies stand inside of it for even a few seconds. In a controlled area, you can deal a ton of damage, zone enemies away from an objective, or split them up as they all scramble to get out of Starfall’s range. In almost all situations, it's a fantastic choice. Taking Starfall however does significantly reduce your survivability and overall healing output, so make the decision wisely. Mark of Mending allows Tyrande to regain 2% of her maximum health back when she attacks an enemy affected by Hunter's Mark. Not only that, but all her allies also benefit from this buff, allowing her - against a single target - to provide group-wide healing, as long as they hit the same target. Trueshot Aura allows Tyrande to reset her Trait instantly, but also grants 20% increased basic attack damage to herself and all those around her. If you're paired up with Raynor, it allows Tyrande to boost damage significantly. Moonlit Arrows is a good talent if your opponents aren't stun heavy. The additional 0.25 seconds reduced off Light of Elune's cooldown, every basic attack, is significant and quickly adds up. It'll allow you to heal much more often, ensuring you've always got a heal to hand. Variable: Stuns are a big part of Heroes of the Storm and Celestial Attunement attempts to reduce their potency. Casting Light of Elune on a hero who is stunned not only removes it, but also takes off any slows or silences. Against heroes such as Uther, Muradin or Diablo, it can help enormously. Only take this against a stun-heavy composition. Taking Shadowstalk stealths Tyrande and provides her with a valuable escape, and ability to heal her team over time. You can stealth into an engagement, use it to retreat and still give out healing alongside your Light of Elune. Great if you're struggling to keep your team alive. Harsh Moonlight is ridiculously strong, and allows Tyrande to slow a single target her Sentinel hits by 40%, while also reducing the damage they deal by 40%. For shutting down a single target, or escaping someone pressuring you, it's pretty mandatory. With Hunter's Mark also cast on the victim, they're as good as dead. Huntress' Fury increases the range of your Trait by 25%, but also allows your attacks to splash from the victim. For AOE pressure, it's absolutely amazing in a team fight. Increasing Tyrande's base attack speed by 25%, Iceblade Arrows grants a much needed ability to further reduce the cooldown on Light of Elune. Iceblade Arrows also lowers the damage a hero deals by 8% for every basic attack you land, stacking up to 5 times. If you can use Shadowstalk with Iceblade Arrows, you fire at ridiculously rapid speeds. This list of tips and tricks are just a handful of things we think will help your Tyrande play. We'll continue to add to the list as required and if you have any tips you'd like to share, let us know in the comments below and we'll place them here. 1. Hunter's Mark increases damage from ALL sources for 4 seconds. The 15% damage increase is enormous and can allow your team to blow up just about any hero instantly. Choose squishy targets if possible. 2. When you've cast Hunter's Mark on a target, try to stun them with Lunar Flare to buy your team time to make use on the damage multiplier. 3. During Objective Battlegrounds, such as Battlefield of Eternity, try to have Hunter's Mark ready for the Immortals. It'll help your team burn them down incredibly quickly. 4. Light of Elune has a long cooldown if you aren't using your basic attacks. You have to constantly be firing at the enemy team if you're to provide solid healing output. 5. The cooldown on Light of Elune is reduced even if hitting minions or mercenaries - not just heroes. If in lane, be sure to hit them if you can't reach an enemy hero. 6. Sentinel will always hit the first enemy it comes into contact with. It no longer pierces. 7. You should regularly be using Sentinel to scout all camps on the enemies side of the map. You need to know where players are all of the time. 8. During a team fight and at level 13, try to save Sentinel so you can make use of your Harsh Moonlight talent. 9. It's sometimes a good idea to cast Sentinel from the spawn point if you've gone back to the Core, as you can then quickly tap Z again to mount up without having to wait (and replenish your mana). 10. Lunar Flare should always be used against key targets to either kill an enemy or defend an ally. It also stacks with other stuns, so you should try to follow up with abilities such as Diablo's Overpower for maximum impact. 11. Don't be afraid to use Shadowstalk early. Its cooldown isn't low, but its healing over time does take 10 seconds.